Age 3 months+. Following the success of the award-winning Baby Sees series, here is the bestselling title in a bigger format! 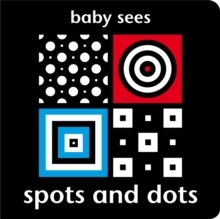 The stunning high-contrast patterns and colours of 'Spots and Dots' will fascinate and captivate young babies. All materials are non-toxic and have been rigorously tested to ensure that the books are safe for babies.